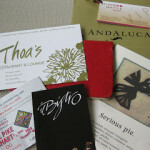 In my travels - Seattle - What about the food? 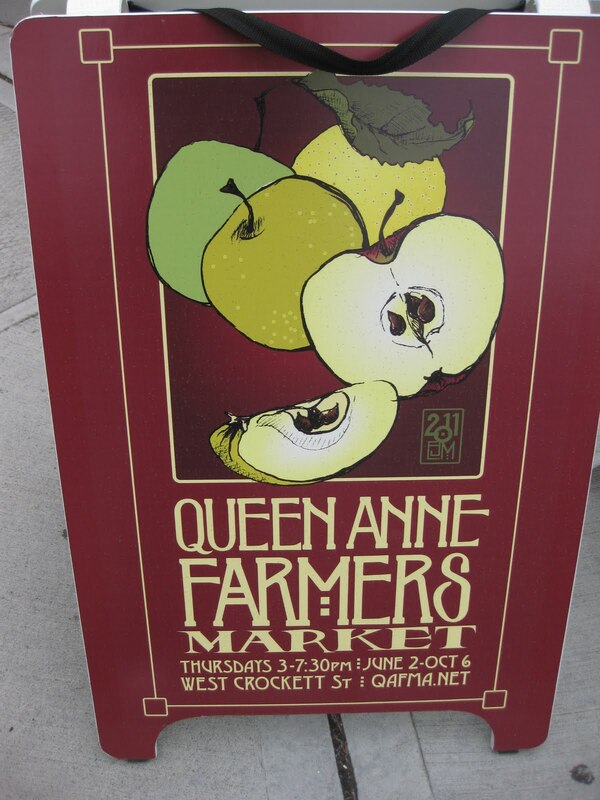 Having a farmer’s market just out your front door is a good thing. Two great grocery stores within half a block, convenient. A fabulous butcher and seafood market a block away, dangerous. 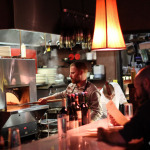 Such is city dwelling in the very wonderful Queen Anne neighborhood in Seattle, WA. Visiting in July when the strawberries and tomatoes are at their finest, delirium. 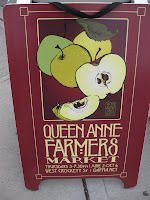 I made my vacation plans so I could shop the Queen Anne’s Farmers Market, that’s how much of a crazy foodie I am. 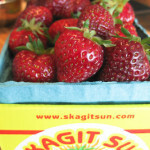 The day did not disappoint, Skagit Strawberries, fresh picked and mouthwatering juicy, targeted for tonight’s dessert. Mt. 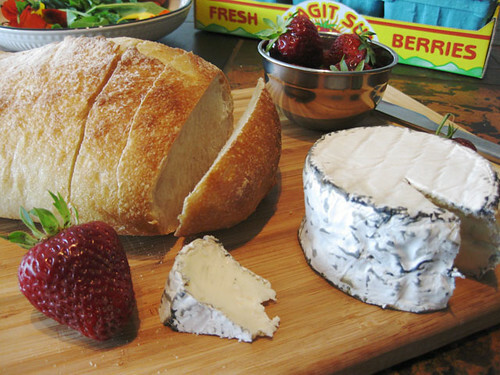 Townsend Creamery’s SeaStack Soft Cheese, oh my. Buttery smooth consistency, with just enough rind, not quite spreadable, but perfect on sourdough. 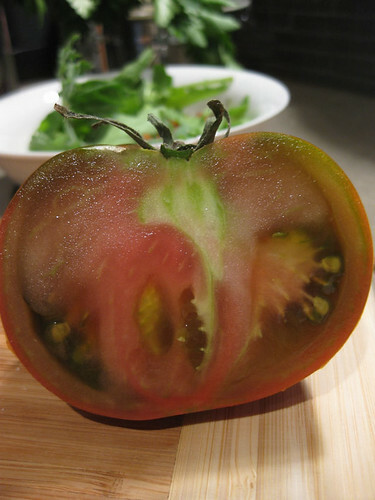 Fresh wild salad greens with bright nasturtiums, and a choice heirloom tomato. 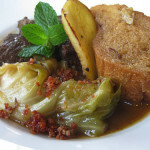 What a pleasure to leisurely walk through the market and pick up a little of this, a little of that for today’s meal. So different than my typical, highly organized approach to lists and market visits that are the routine. To have time for this, to appreciate the local, seasonal and artisan is a gift, a connection with our food and the people who bring their very best. The second story apartment soon hums with music and the rattles and taps of dinner preparation. A nice first day of vacation with my son. 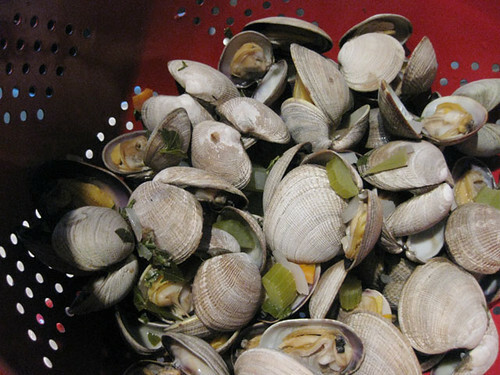 Freshly steamed little neck clams ready to pop into the chowder! 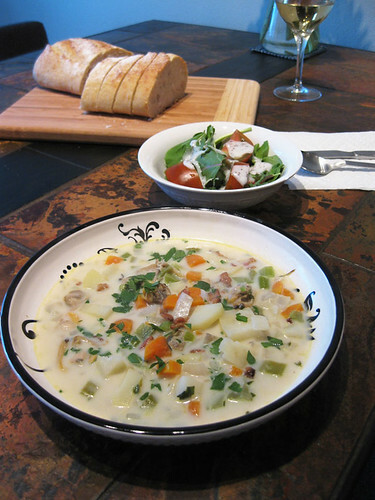 Cool summer night, warm clam chowder. 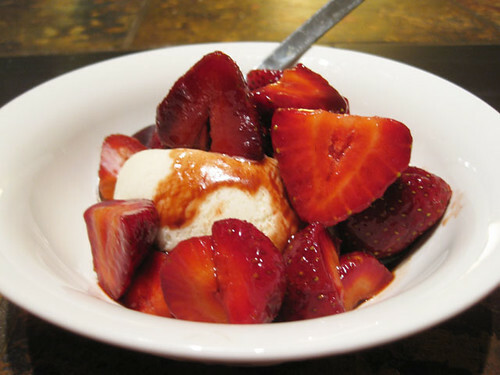 Fresh strawberries tossed with Balsamic Vinegar infused with Fig over vanilla ice cream. 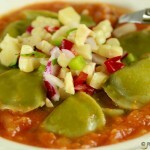 Mmmm, what a lovely travelogue Robin, I was with you for every savory step. I’m sure I would LOVE this eloquent, sea-fluent soup starring beautiful clams. So good, so soothing! Glad you came along for the ride. I am still working on recreating my Dad’s last version of chowder, but these clams were surely the stars of the day, succulent and tender. Sounds like a great trip, right up my street. Chowder is not something I’ve ever made – to be rectifed soon with your recipe.